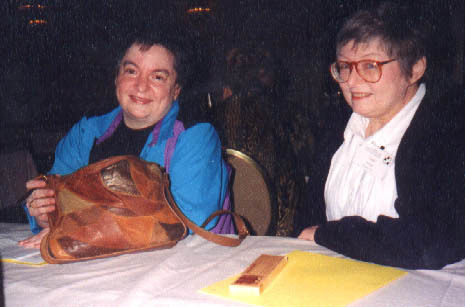 I've never solved a Nancy Salomon (left) puzzle. But I am familiar with her name and the incredible success she's had as crossword constructor. Nancy has had over 180 puzzles published by NYT since 1997, some solos, some collaborated with other constructors. LAT has also published more than 40 of Nancy's puzzles since 2002. Her byline has appeared in NY Sun, Wall Street Journal, CroSynergy Syndicate, Washington Post, etc. Our LAT constructor Gail Grabowski mentioned in her resume that she "learned the ropes" from Nancy. And Mike Peluso, John Lampkin and Jerome Gunderson all talked about how generous Nancy has been in helping them. Hope you enjoy the interview (We will have her puzzle later this month). I found her observations on the novice constructor mistakes to be very interesting. Also laughed that she does not like writing clues. Can you tell us a bit about your background? I read somewhere that you majored in English in college but your favorite course was actually biology. Yes, I majored in English. I did love Biology, but the math requirements for a science major scared me off. Then, professionally, I wound up as a computer programmer! I started with IBM as a technical writer, but they taught their writers programming on the grounds that it might help to know what one was writing about. After going through programming school, I was hooked. I got out of technical writing and into systems programming just as soon as I could. How did you get into crossword construction and who has been the most influential on your own development as a constructor? In 1982 I was disabled with inoperable herniated discs. 10 years later, in one of my puzzle magazines, Stan Newman offered a "course" for beginners who promised to do the "homework." I decided to give it a go. The course led to the creation of a 15x15 crossword. Stan bought the resulting puzzle and I was off to the races. But I did exactly what I advise my students not to do--after my first puzzle I switched exclusively to 21x21 puzzles. I'm not sure why. They're so much harder to construct than dailies. On the plus side, once I finally rediscovered 15x15 puzzles, they seemed like a snap. What is a perfect crossword for you? What kind of theme/fills fascinate you and what are the entries you try to avoid? This is a toughie. The theme is the most important element of a themed puzzle. With today's software, anyone can fill a grid competently if the person is picky enough. I look for the same thing that editors look for--themes that are tight, consistent, and clever. But there are many paths to that end. TAKE A LOAD OFF Dieter's credo? BE A GOOD LOSER Dieter's credo? It was such a stroke of luck to find four in-the-language phrases that could be reinterpreted as advice to a dieter. The crossword gods are seldom this kind! Several constructors mentioned that they are not fond of writing clues, how about you? I hate cluing. It's the one part of constructing that I find to be a chore. What kind of mistakes do novice constructors make and what advices would you give to those tyros? a) Trying to do too much. So many rookies have no realistic idea of how much can be accomplished in a 15x15 puzzle. They try to do 8 theme entries in their puzzle. The result is often worse than just ugly fill. The theme entries need to cross and so the constructors settle for marginal theme entries to meet the grid requirements. Another symptom of trying to do too much is the very low word counts I see from some beginners. They try and do themed puzzles with themeless word counts. I sometimes have a very hard time convincing students that a 78-worder with a solid theme and a good, lively fill, will take them a lot further than a theme-heavy puzzle with a marginal fill and a low word count. b) Settling for inferior fills. Anyone can fill a grid with Crossword Compiler. The trick is getting a good fill. c) Coming up one entry shy of a good theme and settling for a weak, strained entry to round out the set. Often students have a good set, but they mess things up by trying for an extra theme entry or two. d) Themes that are way too broad or inconsistent. Editors like themes that are tightly focused. Many students don't get that at first. Editors also prize consistency. Odd-men-out have led to many a rejection. Yet there are times when inconsistency is acceptable. It depends on the ambitiousness of what one is trying to do thematically. One develops a feel for this after a while. There are plenty more where these came from, but I've run out of gas. What prompted you into mentoring aspiring constructors and how has it changed your life? You know, I'm not really sure how I got into mentoring. I helped a few constructors and then the word just seemed to spread. Overall, it's extremely gratifying. When I started, the internet wasn't what it is today. Like most crossword constructors I mainly worked in a vacuum with some occasional feedback from editors to guide me along. I really enjoy the fact that I can shorten the learning curve for newcomers. They don't have to learn everything the hard way as I did. I'd be lying if I told you it was roses all the way though. The students who drive me up a wall are those who are just looking for someone to confirm the brilliance of their creations. If a constructor isn't open to constructive criticism, he or she should bypass mentoring. How has the crossword landscape changed since you first started in the early 1990s? There's an enormous difference--just huge. One reason is the advent of Crossword Compiler. It's a very powerful tool that can lead to excellent results when used correctly. Thanks Antony! The other, at least as important, is the development of a community of constructors. Cruciverb.com is a godsend to new constructors and veterans alike. Thanks Kevin! A most enjoyable and informative interview. I can certainly believe the Crossword Compiler was a godsend - when did that come along? Certainly cluing would seem to be the most tedious part of constructing, so I can see why many constructors would dislike it. I found it interesting that Nancy was a computer programmer. As someone who also came up through the programming ranks, I've always thought it was a help in solving crossword puzzles. I'm not sure why, maybe something about how you structure your mind to think. I'd be curious to hear Nancy's thoughts on that. Anyway, yet another great interview, C.C. - will you be joining '60 Minutes' anytime soon? Ha ha! You should hear me talk. I can hardly make myself understood. I only asked a few questions, Nancy and other constructors gave very informative and enlightening answers. Interesting observation on how a computer background might help certain people with solving. Tyler Hinman has IT background too. So does Barry Silk. The best of the interview series. Thanks for the special treat. Nancy, can you elaborate on "The theme entries need to cross"? Thank you. Always enjoy these interviews and how people seem to 'fall into' crossword constructing. Interesting how puzzles have and continue to change stylistically and how the themes develop. I used to think that constructors just connected a bunch of stuff without realizing how much is 'behind the scenes' of a really good puzzle. Thanks CC for the great education. I enjoyed this interview. Thank you! It is interesting how people get into it. I wonder if, along the lines of Dennis' observation about programming and ways of thinking, if left or right handedness has anything to do with it. Lefties always look for connections and the "big picture", whereas righties seem to think more lineally, step by step. Great interview C.C. Excellent Questions! I doubt if there is anyone more admired in the crossword constructor community than Nancy. She's not only a legendary constructor, but a teacher of a dazzling array of top-notch puzzle makers. It should also be known that her fee for teaching is extraordinary... nothing! This was an incredibly informative interview...definitely an insight into the actual construction process with the plus that Nancy has mentored so many. C.C. Part of a good interview is the right questions and you always seem to find the ones that elicit the most interesting answers. This helps all of us to a better understanding of the puzzles that give us so much enjoyment. Thank you both Nancy and C.C. I look forward to solving Nancy's puzzle and thought the dieter's theme was exceedingly clever. I like puzzles that give you the same clue for different answers...stretches the imagination. thanks, nancy. "tightly focused" theme is hard to achieve. @frank lin: Nancy, can you elaborate on "The theme entries need to cross"? Well, I'm not Nancy, but if you think about having eight theme entries, some of them are going to have to cross (you wouldn't be able to fit eight theme entries in a 15x15 grid all acrosses, if you think about it. I'm a bit late to this, but better late than never, right? I just want to add that I'm also a tutee. I got bawled out for mentioning someone's name who helped we once, so I was understandibly shy about doing it again. Thanks Nancy for being such an angel! And yes I'm one of the more stubborn ones.